Hudl is also partnering with one of its investors, Nelnet, which plans to use the building for additional growth, including the expansion of its software development team in Lincoln. The plan for development is timely, as Hudl expects to add up to 300 new high-tech jobs over the next three years, creating a need for a much larger footprint. According to the University of Nebraska's Bureau of Business Research, the projected payroll and investment associated with this project will create an estimated $140 million of annual economic activity. 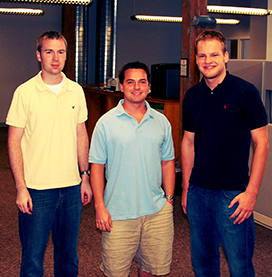 University of Nebraska-Lincoln graduates – David Graff, Brian Kaiser and John Wirtz started Hudl (then known as Agile Sports) in 2006 and moved to the Haymarket’s H.P Lau building in June 2007. Since then, Hudl has become the fastest-growing private company in Nebraska for the last two years. They have also made their mark downtown by and creating over 150 full-time "Hudlies" who currently office in the Salvation Army and Lincoln Fixture buildings. With more than 3.5 million users from 100,000 teams across 30 sports worldwide, Hudl is changing the way coaches, athletes, parents and fans find value in practice and game film. This, continues a rapid trend of development along Canopy Street. Since the completion of the Pinnacle Bank Arena, Lincoln Traction Partners have developed the Railyard, Canopy Lofts, Hobson Place Condos and Hyatt Place hotel from Q to R Streets. Last October, engineering firm, Olsson & Associates, cut the ribbon of their new headquarters developed by Tetrad Partners from O to P Streets. An eight-story senior living complex is also planned to be built on the east side of Canopy Street south of O Street. The redevelopment plan is subject to City Council approval. The partners expect to break ground for the building on the south half of the block in late summer, with a scheduled opening in the fall of 2017.